These 367 acres are on the ridges and hills north of Carbon Canyon Road, spanning from Olinda Village eastward to the San Bernardino/Orange County line within the City of Brea’s jurisdiction. Efforts to acquire the land are now underway. In July 2018, the City of Brea revoked all approvals. View the Resolution. OSLIC appealed to the California Supreme Court but they refused to hear the case. In October 2017, the Appellate Court upheld the Superior Court’s ruling and ordered the approvals be revoked. View the Court’s Decision. And the Superior Court order to rescind project approvals. View the Writ of Mandate. In November 2015, the Superior Court agreed with several of our claims. OSLIC appealed the decision. View the Minute Order. Hills For Everyone filed a lawsuit claiming violations of the California Environmental Quality act and State land use laws. Other petitioners included Sierra Club, California Native Plant Society and Friends of Harbors Beaches and Parks. OSLIC processed the project under the name Madrona. Despite the fact that the site had burned three times, that it proposed to remove 1,400 oak and walnut trees and each home would have used five times the water and average Brea household used, the City Council approved the project in June 2014 with a 4-1 vote (Simonoff opposed). Bill Shopoff, the developer, stopped paying the City for its staff work and so the City stopped working on the project. Eventually Shopoff was foreclosed on by Old Standard Life Insurance Company (OSLIC), a bankrupt company based in Idaho. The project was nearing approval in November 2008 when the Freeway Complex Fire burned the site to the ground. At the northern edge of Orange County, this hill top property can be seen from most of Orange County and is easily identified because of the two white water reservoirs atop it. Houses are proposed to surround the water tanks. A 165 version of the project was approved by the Brea Planning Commission in June 2008 and then appealed to the Brea City Council. Before a decision could be made, the November 2008 Freeway Complex Fire burned the site down for the fourth time in 30+ years thus stalling Council consideration. The original owner (The Shopoff Group) was foreclosed on in August 2009 and the new owner, Old Standard Insurance, is also in receivership. The State of Idaho appointed a trustee to continue processing the project. Idaho renamed the project Madrona, reduced it by three units and pursued approval of the project starting in December 2012. 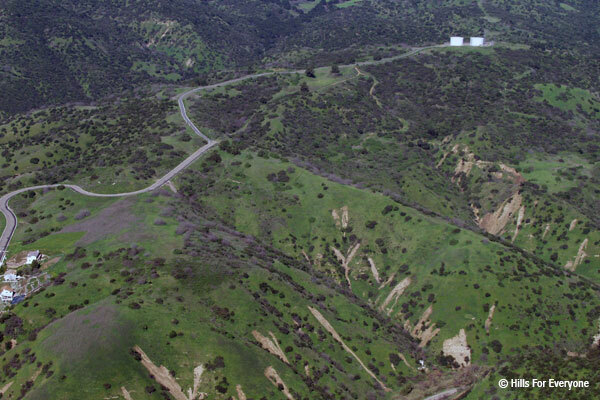 Due to a 2002 legal settlement agreement with the landowner, Brea has to process the project using rules that were in effect when the project application was deemed complete in 2000. These rules are now over 25 years old and all have been subsequently revoked and therefore cannot even be amended. Despite an outpouring of public opposition and documented problems with the project, the Brea City Council approved the project in June 2014. Hills for Everyone, Sierra Club, Friends of Harbors Beaches and Parks and the California Native Plant Society filed a lawsuit in July 2014. The lawsuit maintains that Brea violated state and local planning laws and that the environmental documents were faulty. To get more information on this portion of the Puente-Chino Hills Wildlife Corridor, please visit our other website devoted to Stopping Madrona.